José Shabot Cherem breaks the cycle of poverty, illiteracy, and displacement that affects construction workers in Mexico. José Shabot Cherem breaks the cycle of poverty, illiteracy, and displacement that affects construction workers in Mexico by bringing education, vocational training, and personal development opportunities to construction sites. Jose's New Idea: José is changing the trajectory of Mexico’s construction workers by providing unprecedented access to educational, professional, and personal development services at very little cost to them in terms of time and money. Having grown up in the construction industry, José knew that the nature of the construction business—moving frequently, living on work sites, and working long hours—made it difficult for indigenous, rural migrant workers to finish their basic education and access essential services. His organization, Construyendo y Creciendo (Building and Growing), offers programming that coincides with working location and hours, tailoring programs and classrooms to fit site-specific needs and negotiating on behalf of workers. Key to Construyendo’s success is the network of companies, students, deeply involved teachers, and partners that José has built and empowered. To create real impact, José involved the construction companies—the employers—in his strategy. Although the construction workers are considered the primary beneficiaries, all parties benefit from the programs: companies employ more productive workers and have a lower turnover rate and teachers enjoy steady, rewarding employment. José’s innovation reframes the value of education, revealing extensive, far-reaching benefits that compel workers and employers to prioritize learning in an unprecedented way. Along with education, José connects workers to a wide spectrum of essential services. People previously unable to navigate or afford medical care have access to eyeglasses, vaccinations, and improved personal hygiene. By changing the level of education for many parents, Construyendo ends systemic illiteracy as construction workers pass on to their children both their thirst for knowledge and education. The success of individual classrooms leads to the growth of the program; more companies join based on the results of increased productivity and more workers join based on the elevated quality of life demonstrated by their peers who have participated. Jose hopes for rapid spread across Mexico, and later, the rest of Latin America. Workers will be able to continue their education seamlessly across different worksites and companies. 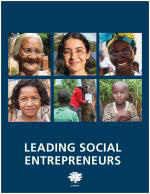 Jose' s story appears in the 2018 edition of "Leading Social Entrepreneurs" which features a selection of just a few of the Ashoka Fellows recently brought into the largest global network of social entrepreneurs. The LSE presents some of the newest innovations by leading social entrepreneurs whose ideas are changing the way things are done all over the world.